Cram is a fast, fun-filled arcade game. It takes only seconds to learn, yet is sure to entertain you for hours. Using the arrow keys on your keyboard, you control the direction of a growing line. 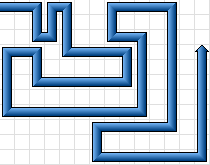 The objective is to make as many turns as possible without running into yourself or hitting the wall. Sound easy? It isn't! If you play Cram, please write me with your high scores and tell me what you think. Thanks!